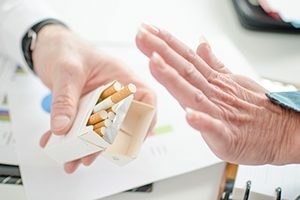 While nobody enjoys getting lectured about a bad habit, it’s important to have all the relevant information available to you, especially when it involves health implication. So if you need any extra motivation to help you quit smoking, we’ll discuss some of the lesser known problems it can cause. It isn’t just your lungs that suffer! Of course, anyone can understand the relationship between smoking and lung cancer, but there are serious oral health implications too. Gum disease significantly increases with smoking, as nicotine seems to discourages the growth and regeneration of these tissues. Once gums disease sets tooth loss isn’t far behind. Not to mention oral cancer… smokers are 10% more likely to develop the disease. Fire – The leading cause of burn deaths in the US are fires started by lit cigarettes. Low birth weight babies – A report issued by the Centers for Disease Control concluded that if all women quit smoking during pregnancy, about 4,000 new babies would not die every year. Wrinkled faces – Smoking causes tiny facial blood vessels to constrict. This restricts blood flow and contributes to premature wrinkling that’s often irreversible. Help is abundant—get it and quit! Fractured bones – Study after study links a history of smoking with osteoporosis, the brittle bone disease that affects primarily elderly women.